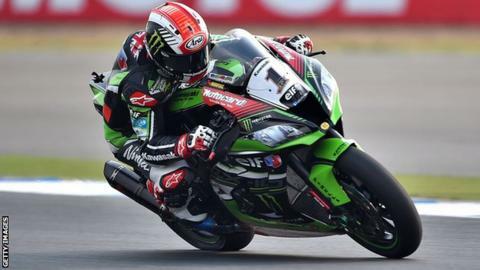 Jonathan Rea followed up Saturday's win at Assen with victory in the second race to move 45 points clear at the top of the World Superbike standings. The track dried out after a wet start with Rea and Kawasaki team-mate Tom Sykes coming in earlier than their rivals for a tyre change. It was a decisive move and Rea finished two seconds ahead of the English rider with Michael van der Mark third. Welshman Chaz Davies came in fifth and remains second in the series. Davies, who was second to reigning champion Rea in Saturday's opener, is 14 points ahead of Sykes. Australian Josh Brookes set the early pace on Sunday before Rea, who was lying fourth, and Sykes came into the pits with 14 laps remaining. The Kawasaki pair were soon out in front and they went head-to-head for the win but Sykes could find no way past Rea. Dutchman Van der Mark delighted home fans by completing the podium. Lorenzo Savadori was fourth while Brookes crashed out as he attempted to make up ground late in the race. It was a ninth Assen victory for 29-year-old Rea and his fifth successive win at the Netherlands circuit.